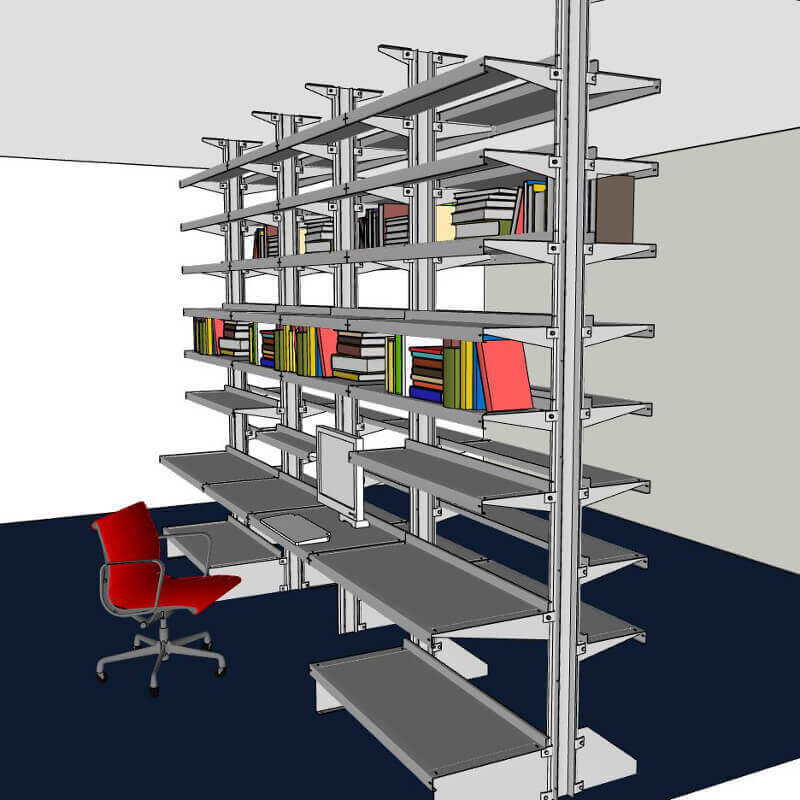 Room Partition ⋆ Shelving Systems by E-Z Shelving Systems, Inc.
E-Z’s freestanding, back-to-back uprights serve as the vertical supports for this room partition. Select from over a dozen shelf depths to create storage, display, or work surfaces as needed for each side of the partition. Ask your E-Z shelving specialist how to integrate lighting or privacy screens, and for the best anchoring options for your system. This form assumes a single or double-sided partition. For multi-wall configurations please call us at (800) 353-1331, or upload a drawing below. For systems with varied shelf depths please upload a drawing or describe your configuration at the bottom of this form. Upload drawings, plans, elevations, photos of your space. Accepted file types: pdf, jpg, dwg, png. Foot brackets anchor the system and function as supports for the lowest shelf tiers. Aubrey brackets anchor the system where foot brackets aren’t desirable. Ceiling brackets add stability by attaching to overhead beams where available. Room partitions can be single-sided, double-sided, U-shaped, T-shaped, etc. The possibilities are endless. Architects have even incorporated plumbing and sinks. Edge stops and shelf dividers for library shelves. 20-30″ depth shelves as desktops. 6″ depth shelves for utility surfaces or cable runs.